The parade starts at 11:00 a.m. Abby will be joining the contingent but needs to remain at First Church through the healing prayer circle after worship. Therefore, First Churchers are encouraged to meet up with the UCC contingent on their own. If you are concerned about getting downtown, please let Abby know, and we will coordinate transportation. Let Abby know if you’re coming! Email ahenderson@firstchurchmn.org. Here are some photos from my ordination on June 13, 2010, at the Exeter Congregational Church in New Hampshire. Click on the thumbnails to see larger versions! 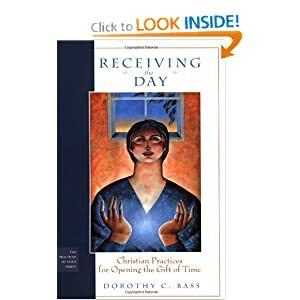 Ironically, I re-read the first chapter of Receiving the Day by Dorothy Bass as my plane tore through the miles between Boston and Minneapolis. This flight constituted the last leg of my journey to Abby’s ordination in New Hampshire, which, with the “help” of the airline, turned into an epic exercise. Let’s just say I slept in Atlanta the night before, and got up at 3 am Central time two mornings in a row! So, there I sat, literally riding on the current of our culture’s frantic, fragmented ways of relating to both time and space, even as I pondered the spiritual practice of keeping time sacred. Good morning! I’ve had my coffee! I am not a morning person! I am barely human BC (that is, “before coffee”). I have tried, and failed, over the years, to connect with my inner “early riser”. And yet, I realized last week that, at this point in my life, getting up earlier is the only way to claim time for exercise and prayer. Against all odds, I decided to try again. Since two days do not make a new habit (they say it takes three weeks), I offer these reflections humbly, and a bit reluctantly. Please be gentle with me if I do not prevail : ). Hi folks. This is the book that Jane and I will be reading and blogging on this summer, if you want to follow along! Just click the image to go to the book’s page at amazon.com.